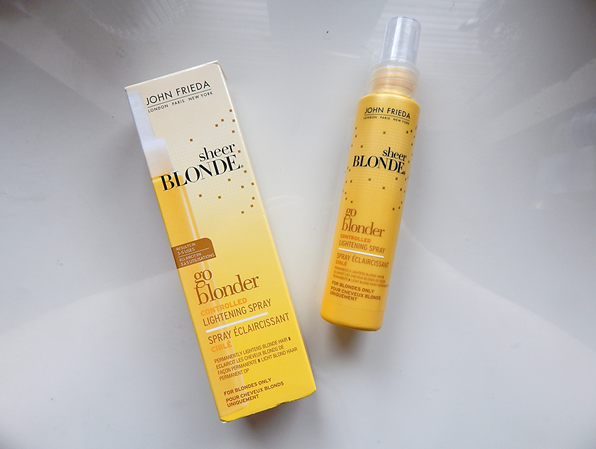 I feel like the John Frieda Sheer Blonde Go Blonder range is a bit of a marmite brand - you either love it or you hate it. I've heard many a bad review about their products (especially since that Fleur DeForce video) but I've honestly, hand on heart, never had an issue with any of their products. I've been using the Go Blonder Shampoo and Conditioner for months along with the Brightening Oil Elixir and so far, no scary side effects - just clean, non-brassy hair. I've recently added the Sheer Blonde Go Blonder Controlled Lightening Spray to my collection and I'm actually pretty impressed so far. I've been using this for a few weeks now and I've been spritzing it thoroughly through my clean, wet hair after every shower and I've definitely noticed a difference in brightness throughout my barnet. I'm not sure if it's completely down to this since I use so many other products from the range but I know it's definitely a contributing factor. If you have blonde hair, I wholly recommend this range. I understand there's quite a bit of controversy surrounding it but you'll never know until you try. You might end up loving it.